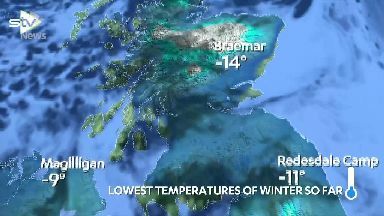 The lowest temperature in the UK was recorded in Braemar, Aberdeenshire, on Thursday. Temperatures have dropped to their lowest level in seven years, plummeting to a low of -14.4C in Aberdeenshire. Braemar became the coldest place in the UK since February 11, 2012, when it fell to -15.6C in Holbeach in Lincolnshire. All four countries in the UK set new records for the 2018/2019 winter overnight, with Sennybridge, Powys, dropping to -9.3C, Katesbridge in Northern Ireland falling to -8.2C and Redesdale Camp, Northumberland, recording temperatures of -10.5C. Freezing: People in Scotland should be prepared for snow. The deepest snowfall recorded by the Met Office was 11cm at Tulloch Bridge near Inverness on Wednesday while forecasters warned that most of Scotland should now be prepared for snow. These freezing temperatures have led to weather warnings being issued by the Met Office for snow, ice and fog on Thursday and into Friday. 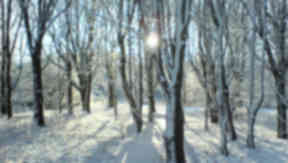 Met Office forecaster Mark Wilson said the cold temperatures were due to stick around. "It's been a very, very cold night. On Thursday night we could see similar temperatures in Scotland. "Saturday night into Sunday could also be very cold." The low temperatures are related to the polar vortex gripping much of the US. People in Chicago experienced temperatures of -30C, colder than parts of Antarctica. The US National Weather Service warned that frostbite is possible within just ten minutes of being outside in such extreme temperatures. And although temperatures are not as cold in the UK, a jet stream that stems from the polar vortex has passed over the country.